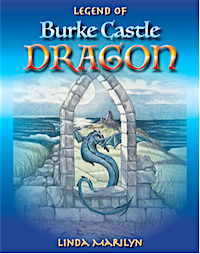 A tale about the Burke Castle dragon legend among Ireland's legends and folklore. A mysterious dragon hatchling appears in Lady Laurie's satchel while picking violets for her chamber during the early 1950s. How is that possible? Dragons are myths and only exist in old folklore and legends, right? Could it be real? The event leads the family to dive into past history of their ancestors and what they discover is a forgotten legend that casts their lives into one of Ireland's realms of notorious dragon wizards and their connection to the Old Norse invasion, centuries past. With the help of family friends and experts on folklore, they find long forgotten caves with treasures and hints of who their ancestors really were and from where they came when Ireland was only divided among the warring clans. A surprising twist at the end reveals who the dragon wizard of the Burke castle ruins was and solves one of the mysteries of the Burke's family history. A whimsical tale of dragons and old Irish legends.